ASUS will continue to sell the original three-radio Lyra (MAP-AC2200), which had pretty disappointing performance when I reviewed it with its original firmware. When ASUS came out with firmware that was supposed to significantly improve performance, I loaded it up and started testing. But when I saw little improvement in backhaul throughput, I knew I wasn't going to see much performance improvement and stopped the retest. Trio reaches back a few years for its physical and antenna system design. I knew I'd seen the hollowed-out pyramid design before and a quick trip to our search box unearthed the EA-N66 that was reviewed in 2012. Both designs stash the three dual-band antennas in the pyramid legs as shown in the cutaway view below. 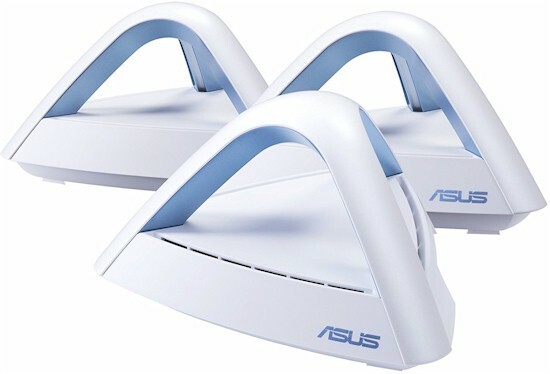 Each Trio node in the three-pack is the same and sports two Gigabit Ethernet ports, one of which connects to your broadband modem to create the root node. Lyra Trio communicates status via LEDs at the base of each pyramid leg. The LED decoder table below from the reviewer's guide is more complete than the one in the quick start guide shown below the table. The Trio's FCC documents are under wraps for awhile. So after testing was done, I opened up one of them for a look. The design is a departure from the usual Qualcomm IPQ4018/4019 mesh design. Instead we find something you'd be more likely to find in an inexpensive 802.11ac access point. The photo below shows the same view as above with RF can top removed. A Qualcomm QCA9563 3x3 b/g/n SoC (photo center right) serves as the main processor and three-stream 2.4 GHz radio, while a QCA9980 a/b/g/n/ac 4x4 SoC (only three RF chains are used) handles 5 GHz duties (photo left). RAM and flash are sized to save money at 128 MB and 32 MB, respectively. The photo also shows an Atheros AR3012 Bluetooth 4.0 radio tucked into the right corner of the RF can and QCA8334 gigabit Ethernet switch down near the two Ethernet connectors. The little RF can at the top holds one each of the 2.4 and 5 GHz Skyworks front end modules. The next photo is the top of the board with its heatsink in place. Once you remove the heatsink and RF can top, you see the flash chip and front end modules for the other two RF chains for each band. The original Lyra board is shown below for comparison. As noted above, it's more of a typical Qualcomm-based mesh design. The table below summarizes the Trio and original Lyra's key components.